Baby K'tan active baby carrier is an ideal blend of a sling, wrap and baby carrier, providing the positions and benefits of all three. 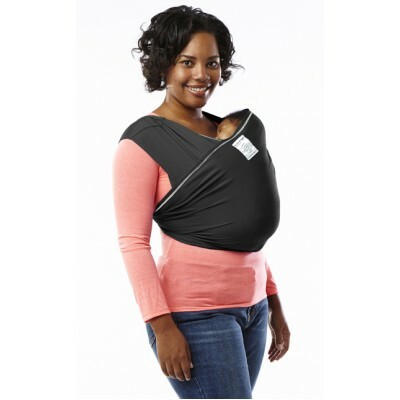 As easy as a t-shirt to put on and take off, the Baby K'tan active baby carrier is lightweight and compact like a sling, yet goes over both shoulders to evenly distribute baby's weight like a structured carrier. Sized (XS, S, M, L, XL) to the wearer, an adjustable back support band offers the wearer extra back support and makes it easy to adjust baby or toddler's weight distribution across both shoulders. Extremely simple to use, this parent-invented baby carrier's secret is its unique double-loop design, which provides added security for carrying baby and privacy for mom while nursing. Machine washable, dryer safe, and comes with free matching storage bag are many benefits of babywearing for both parent and baby. You can safely carry a baby weighing 8-35 pounds with multiple ergonomic positioning, double-shoulder weight distribution and a wide back support band for optimal back support. Alternatively, you can choose your size according to the chart below. Generally, the Baby K�tan size corresponds to the wearer�s fitted t-shirt size. Please note that the Sizing Calculator above may be more accurate since it takes into account the Sizing Notes located below the sizing chart. If you are in-between sizes or if 5�2� or shorter, choose the smaller size. If pregnant, base size choice on pre-pregnancy sizes. Sizing generally corresponds to wearer�s fitted t-shirt size. The Baby K�tan is meant to fit snugly to allow for stretching. If the carrier feels a bit snug the first time you put it on, this does not necessarily mean it is too small. Per the Baby K'tan distribution policy, this item is NOT available for sale outside of US. If an order is placed to be shipped outside the US, we will have to cancel the order. We apologize for any inconvenience.